How do I ask screening questions? Our Hiring Coaches are happy to handle screening questions for you! Want to ask your applicants a couple of specific questions about their background, availability or qualifications? WizeHire's Hiring Coaches are happy to add those for you. We'll ask you about it just before you hit the green 'Save and Preview' button towards the bottom of the screen when creating your job ad. Just click the link that says 'Get live support' and message us. We'll handle the rest! Already asking questions and you'd like to change them? 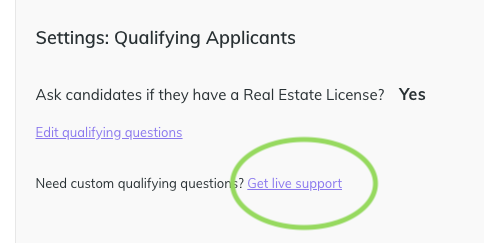 Open the green chat window on the lower right of your screen and we'll get your screening questions changed up.